Teksta is an 8 week old life like robotic puppy that responds to your voice, physical gestures, lights, sounds and even an app on your tablet device. 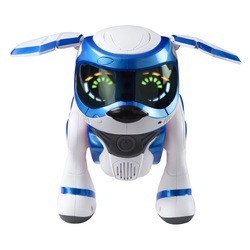 Engineered with state-of-the-art artificial intelligence programming, Teksta will bark, cry, whine, and change his eye patterns in ways to show you how he’s feeling. Teksta has state-of-the-art sensors to know if he is being pet, fed, talked to, and played with. As your devoted companion, Teksta will fall asleep when the sun goes down and wake up happy to see you. In short, he acts like a real puppy! New Hand Gesture Technology: He can walk, stop, sit, and perform his most spectacular trick of all - a back flip! Sound Recognition: Wags his tail and moves his ears when pleased to see you and walks to you when called. Touch Sensors: Pet the top of Teksta's head to make him happy. App Program: Create more Teksta tricks using the free downloadable app. 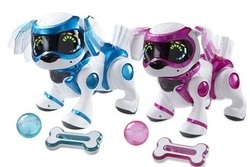 Teksta Robotic Puppy: all the fun, none of the mess! The new fourth generation Teksta featuring the latest in robotic technology with over 100 physical and interactive play features. No remote control needed! Now with unique hand gesture control you can control Teksta with simple hand movements; train Teksta to stop, sit, and watch him do his most favourite trick of all, a back flip! With his expressive beaming eye patterns that light up in different colours, learn how Teksta is feeling , know when he’s hungry, wants to play or simply wants your loving attention. 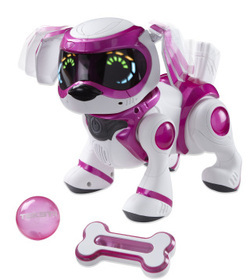 Teksta comes with his own ball to play fetch and bone accessory so you can feed him when he’s hungry. 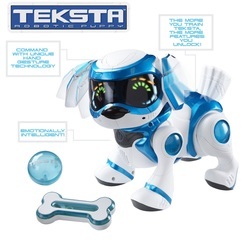 With wireless and infrared technology you can train Teksta to play with his friends, control his dance moves to your own music library and let him bark with his friends through his app features. And download the free app for added bonus feature and programme Teksta wirelessly with Apple + Android Tablets.